“I wish someone had told me” is a series of posts that feed into our inquisitive nature at CN&CO. Each week we hear from someone in our network about something interesting or surprising that’s recently happened or occurred to them. These blogs are a way to pay it forward and form part of CN&CO’s belief that the world can be a better place – and we all have a responsibility to make it so. This week’s post is by Emi Adriano. Having been part of the CN&CO team for just over half a year, when asked who I work for and what it is that we do, the same question always seems to recur, “What exactly is a lifestyle business?” CN&CO is about people and priding ourselves on making a difference and having fun while doing so. The balance between work and life is essential: Life = work = life. Being a lifestyle business, the team is constantly on the move. Whether working with clients out of office, travelling to international destinations in support of clients such as Club Med, or simply spending time with friends and family, the balance between work and lifestyle is vital. Our focus remains on meeting the end goal and doing a damn good job at achieving it. Ji Lee once said, “Make your passion your paycheck.” We believe that when we are clear what our goals are, and when we gain knowledge from others, inspire and trust people, their performance will always be brilliant. By no means does this mean being confined to an office space. I am the type of person who is inspired by places and people. Gaining perspective often means stepping out of the office space and working in different places and spaces; listening, observing and being proactive. For people who are constantly on the move, you may be wondering where the best places are to work out of the office space. Be it because the office WiFi is down, the electricity is off or simply because you need a change of scenery and vibe, where you choose to work should always be conducive to what you want to promote and achieve. Situated in the little hub of 44 Stanley Avenue in Milpark, Bean There is a medium-sized coffee roastery that is the perfect place to get some work done. The environment is bright and welcoming offering free WiFi and a comfy spot to sift through emails, offering an inspiring African feel to assist your creative juices when writing blogs. There is also a meeting room accommodating up to 12 people that can be hired out for R100 per hour. Not only is the coffee ranked among the best in South Africa, the space is certainly perfect for any out of office work. The coffee shop is open seven days a week and is a definite go-to when it comes to getting work done, with the added benefit of some of the finest coffee Johannesburg has to offer. Location: 44 Stanley Avenue, Milpark, Johannesburg. If you are looking for a perfect spot for a mid-week lunch meeting, Daleah’s is certainly a firm favourite. Boasting a relaxed, trendy atmosphere, this little eatery situated in Braamfontein is the perfect place to meet with clients or colleagues to share ideas and discuss upcoming projects and ventures. The WiFi is free and unlimited, allowing for easy accessibility when it comes to checking emails or working on online documents. The space is certainly authentic and quirky and gives off the perfect creative touch. Definitely one of my all-time favourites. Take a trip down Jan Smuts and you’ll find Warm&Glad, a spot that is full of personality. The space has become one of the most popular hangouts to get some work done (while taking advantage of their free and fast WiFi) or alternatively just to step out of work mode and unwind to the sounds of great music that sets the scene for a perfectly chilled and warm space. Its coffee of choice is Cape Town’s finest Deluxe, which is certainly one of the best coffees on the market. Warm&Glad also houses a shop called Rad that sells a number of nifty goodies, perfect for presents for colleagues, clients or friends. 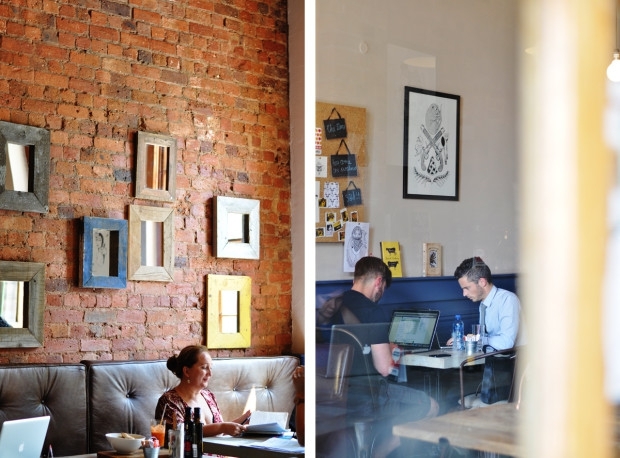 With the added benefit that it happens to be just under our CN&CO office Wolves is the perfect neighbourhood coffee bar is the perfect space for anyone that is looking for good music, strong coffee and a sweet treat during the hustle and bustle of a busy work week. Feel free to settle down for a few hours of work. Stick your earphones in and shut yourself off or enjoy interacting with other like minded creative and alternative individuals: who knows, a business venture may be on the horizon. The cafe is open 7 days a week and has fast, reliable Wi-Fi, an added benefit for any technologically reliant individual. With an awesome team, how can this out of office experience not be enjoyable? Situated in Birdhaven in the perfect in-and-out, one-stop centre that includes a beauty salon, hairdresser and dry cleaner (to name but a few), Voodoo Lilly is certainly a great out of office setting that offers free and fast, easily accessible WiFi to meet all your work needs. The space is bright and open and is perfect on a summer or winter’s day. Bask in the sun under umbrellas in the summer or enjoy the cosy indoors during the winter while sipping on your favourite coffee or a famous Voodoo Lilly freezocino. Priding itself on fresh products and health foods, it is certainly the perfect stop-off for a midday lunch break – but don’t forget to take your laptop with you to ensure that you aren’t missing out on any work that may be happening on the go. With endless places and spaces in and around Johannesburg, these are only a few of some of the many out of office friendly spots that make working on the go that much more exciting. Always be inspired by spaces, places and things that are happening around you the same way you are about people and connections.